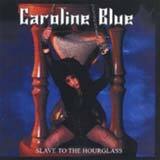 Caroline Blue is a three piece band from upstate New York that really knows how to rock. After listening to this EP a few times, I thought to myself that these guys have captured the spirit of Kiss, Mötley Crüe, and even a bit of Motörhead very well. Afterwards, I ventured onto the band's website, and found that they compared themselves to Kiss, Mötley Crüe, and Judas Priest. There have been numerous times in the past where I've disagreed with a band's description of their sound, but the guy of Caroline Blue know exactly what they're doing, and are very good at it. These five tracks are no frill, heavy rock anthems that melt the attitude of early Mötley Crüe with the party / arena rock catchiness and fun of Kiss. Some of the heavy riffing (such as can be found in The Queen of Pleasure) and blazing solos remind me of Motörhead as well. Musically speaking, Caroline Blue delivers a solid wall that is sure to get your neck moving. The riffs have a raw, in your face edge that add a lot of character to the band's sound. Ensuring that the impact of the music is not lost, the bass guitar has a bold presence that provides a full and complete sound. Sonically speaking, this CD is very polished and professional sounding for a self financed release. Each instrument is mixed at the proper level, and the sound is clear, without losing it's hard edge. Vocalist Wayne Johnson sounds very similar to Paul Stanley, but certainly is not trying to sound like a clone. Obviously, his delivery is a perfect fit for this style of classic heavy rock music. The man does not fail to deliver as he sounds very motivated and into his music, judging from these 5 songs. Of the 5 songs featured on this EP, I found each one to have lasting value and provide me with a nice kick in the rear to get my blood moving. If the band can come up with an entire album of this quality, they mold a nice career for themselves. Fans of 80's heavy rock with an attitude should stop by Caroline Blue's website (link at the top of the review) and learn more about this band. As the band continues to improve and (hopefully) secures a record contract (and recording budget), I envision one hell of a debut album coming from Caroline Blue.